There’s an epidemic in today’s society. We are borrowing on our lives. And payment day is coming earlier and earlier. Maybe I am a tad biased. After all, I do work in the bankruptcy industry and as a result I meet with a select segment of society. But I think I have some ability to weigh in as I live in that segment – you know the segment I am talking about – the middle income earners – the ones’s who make enough to get by, fluctuating from ‘barely surviving’ to ‘comfortable’ – waiting for the day when we can say goodbye to financial struggle and live a stress-free, credit-free life. Is it sad, that at age 40-something :), I look forward to retirement? That in the same breath I fear it, simply because I have little (translated into none) savings at this point because every day, every week, every month, the cash flow that I do have pays for our basic living needs and ensuring that our kids get to have some opportunities in their lives? Now don’t get me wrong, I am not wallowing in self-pity, we are financially-challenged because we chose a lifestyle that puts our children first and as a result are living off of one income. Whether you CHOSE to live off one income, or ARE FORCED TO due to employment issues, health issues, etc., doesn’t matter, the outcome is the same. Making financially conscious decisions is a necessity! This choice, or circumstance can have a happy ending, but instead, some individuals (ok, arguable most) take the wrong path. Instead of making a conscious choice to live a more frugal life, they (I’m guilty of this throughout my life) attempt to live a life that their new income level does not support. I’m not necessarily referring to lavish trips and belongings that exceed your ability to pay for them (although that may be part of it), but simply spending a bit more than you make on necessities. Things like groceries, gas, children’s recreation. And herein lies the issue, embodied in the statement I just made, “spending more money than you make.” Can you spend more than you make?” Let me rephrase that question, “Can you spend more than you make without credit?”. Of course not. That’s an easy question. 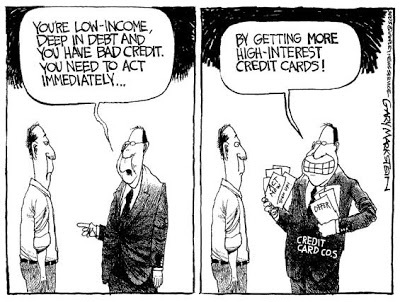 Many moons ago, when credit was difficult to get, we defaulted to living within our means. Not today. Today we have credit, and lots of it. Not making enough income? No problem! Borrow to make ends meet. Hence the phrase I started with, “We are borrowing on our future lives”. Imagine this…Imagine someone said to you, I can give you a more comfortable life now. I will fund it for you. You decide what you want. Do you want to live just a little better than you are now? A lot better? Do you want to take trips you can’t afford? Live in a house that is beyond your means? Drive a car that you wouldn’t have otherwise? I’m going to give you the money to do so, but…and this is a BIG BUT…here’s the deal – At some point, you have to decide that you are no longer going to live this way, and that you have to give up all this extra living, and go back to a very basic lifestyle, and pay me back, with interest. This could be in your 50’s and last the rest of your working life. It could be in your 70’s and you may have to give up any hope of a comfortable life in retirement. Would you do it? This is the decision many are making, or not making, on a daily basis. It’s not that it is being made consciously, but the result is, at some point in your life, you sit up, take notice and say, “Hmmmm…I (we) can’t continue this way. We have to drastically change our lifestyle if we want to be out of debt before we die”. Sound familiar? Sometimes the message comes a tad more strongly than sitting up and taking notice, sometimes you hit “the proverbial brick wall” or are “rudely awakened to the fact” with collection notices, foreclosure notices, etc. The good news is (yes, there is a silver lining, there is ALWAYS a silver lining – at least in my world) that you can take steps to stop the madness! 🙂 The first step is AWARENESS. Get a handle on where you are living today. And where you should be living given your income. Based on your current income, are you in the Survival Zone, the Comfort Zone or the Desired Zone? How do you tell? You add up your basic living expenses, subtract it from your income, and look at the difference. If you make more than enough to meet your basic living expenses, you are above Survival. If you make enough to cover your basic expenses and deal with things that arise (ie. car repairs) you are in the Comfort Zone. If you have enough to meet basic expenses, cover things that come up AND spend money on extras (trips, dining out etc.) you are in the Desired Zone. Next, look at your spending habits over the last 6-12 months. Have you consistently been spending more than you make? In other words, is you outstanding credit increasing? If the answer is yes, you have conveniently moved yourself up on the scale and are living a life beyond your income. If that is the case, it is time to take a closer look at your habits and make some changes. Refusing or neglecting to do so will only postpone the inevitable and made the decisions a necessity later on, rather than a choice. You only have three choices in life: Give up! Give in! or Give it all that you can! Which will you choose? FREE is Fabulous! ~ 6 tips to eating healthy for less! Where do I turn when my finances fall apart? Next story Do I pay off my high-interest card or low-balance card first?